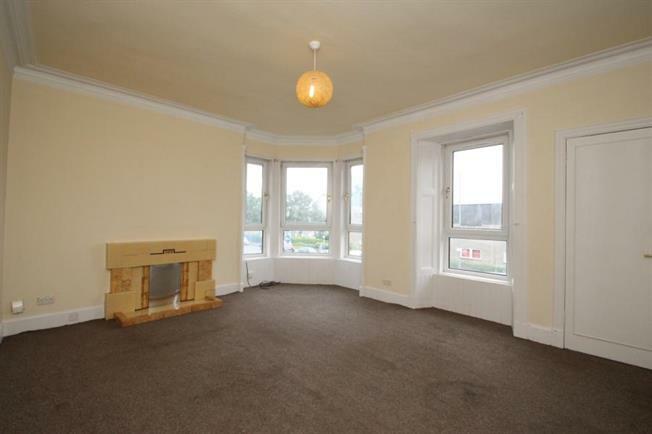 2 Bedroom Flat For Sale in Falkirk for Offers Over £55,000. A well placed and proportioned two bedroom first floor flat that enjoys a fabulous corner position within local admired building with open outlooks to the front. The property can be accessed from Union Road, turning left into the residential car park located towards the rear, which provides ample residents and visitors parking. The first blue door, gives access to the communal close. This large home would suite a wide spectrum of the market and is ideally placed for all the amenities that Camelon Cross has to offer. The accommodation comprises a reception hallway, bright generously proportioned corner position lounge, side facing kitchen complete with a range of base and wall mounted and work tops, two double bedrooms and a three piece family bathroom. There is also a substantially sized storage cupboard that is access from the hallway. In addition the property has good storage throughout and benefits from double-glazing and gas central heating. Early viewing is recommended to fully appreciate the level of accommodation on offer and can be arranged through the Falkirk branch of Slater Hogg & Howison. Camelon provides local shopping, schooling and civic amenities. The nearby town of Falkirk provides two main line rail links offering express services to both Glasgow and Edinburgh. The area also proves popular with commuters seeking access via surrounding road and motorway networks to centres of business throughout the central belt.